Donald Joseph Kettler was born in Minneapolis, Minnesota, to Joseph and Marguerite Kettler. His family later moved to Sioux Falls, South Dakota, where Kettler and his three siblings were raised. 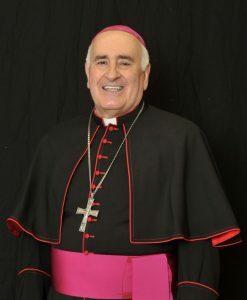 He received undergraduate and divinity degrees at Saint John’s University in Collegeville before being ordained to the priesthood on May 29, 1970. Bishop Kettler then served as an associate pastor in Aberdeen and Sioux Falls until 1979, when he began coordinating work for the diocesan offices of Sioux Falls. In 1981, he entered The Catholic University of America, where he obtained his licentiate in canon law. Bishop Kettler was named judicial vicar of Sioux Falls in 1983, and resumed his work coordinating its diocesan offices from 1984 to 1987. During this time, he also began celebrating a weekly televised Mass. After serving as rector of St. Joseph’s Cathedral from 1987 to 1995, he was pastor of St. Lambert Parish from 1995 to 2000, and of Christ the King Parish from 2000 to 2002. Bishop Kettler was also a member of the Sioux Falls Diocesan Finance Council, Stewardship Committee, Catholic Family Services’s board of directors, the Association of Christian Churches of South Dakota’s board of directors, and a board member of the Sioux Falls Catholic School system. On June 7, 2002, Bishop Kettler was appointed the eighth bishop of Fairbanks, Alaska, by Pope John Paul II. He received his episcopal consecration on August 22 from Archbishop Roger Schwietz, OMI, with Bishops Michael Warfel and Robert Carlson serving as co-consecrators. He was the first diocesan priest and non-Jesuit to head the diocese. Pope Francis named Bishop Kettler the ninth bishop of the Diocese of Saint Cloud on Sept. 20, 2013; he was installed on Nov. 7, 2013.